There is one dish that I personally love to eat but too lazy to cook. So, once in a while if I am not too lazy I will make a big batch of sambal hairbee or dried shrimps. It is so versatile. I use it as a dish with white rice, make sandwiches, put it to add zing to my instant noodle and use it for quick stir fry vegetables. 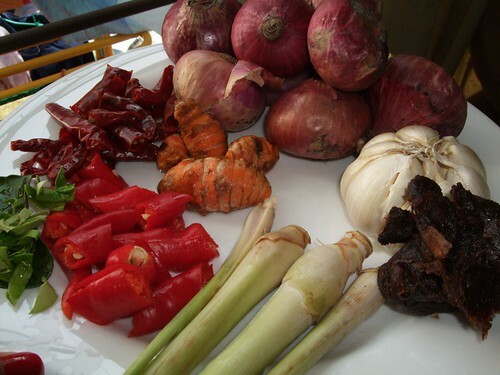 The reason I hate cooking this is because I need to blend those herbs and chillies shown below. Then, I need to stand by the stove for a while to stir the blended chillies and onions with the dried shrimps till they are dry. That’s why when I make them, I cook it in a big batch and store them in my freezer in individual portions. 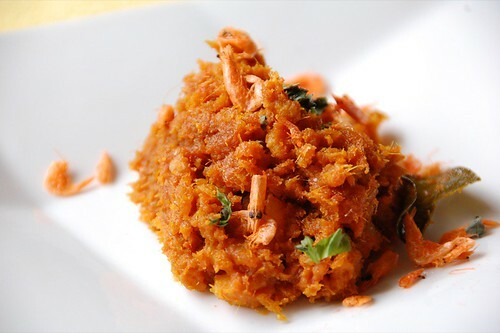 I have posted the recipe for sambal hairbee or dried shrimps sambal many months ago. Anyway, each time I cook, I use different portions of ingredients. The above are what I used. Blend all the above ingredients with the tamarind juice. Try to get very fine blend. Blend the dried shrimps COARSELY. You do not want to make it too fine. 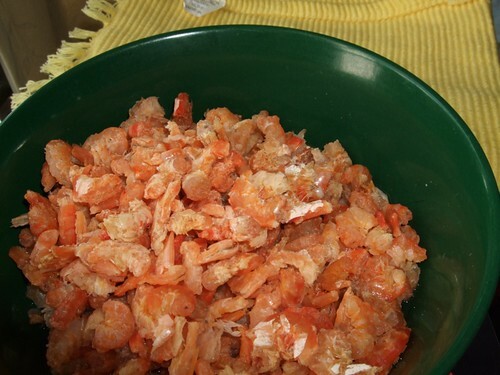 Leave some of the dried shrimps whole. 3) Put these blended ingredients into the pan (WITHOUT OIL) and let the heat dry the water a bit. 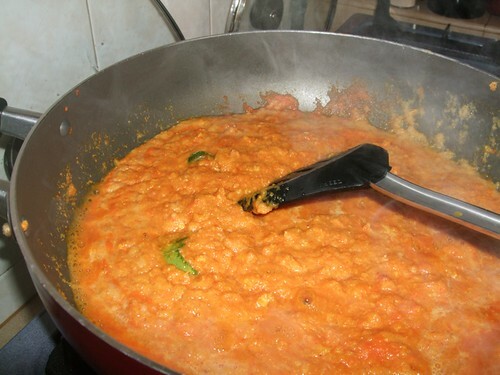 6) You need to stir at least 30 minutes to make sure that the shrimps and chillies paste are fragrant. Good quality dried shrimps is very important. I normally buy the local ones which is rather costly. I think one needs at least RM12 of dried shrimps. I buy these from the stall in Batu Lancang market (the stall with a few lengjais hehehe). Since I need water to blend, I need to stir the blended paste in the pan for a while before the water dries up. Add the oil only after the water content is less or you will get a soggy, moist sambal which does not taste nice. The aim is to make the sambal hairbee as dry as possible. Can you imagine how tasty crispy, toasted french loaf with a dash of butter and mayonaisse is with a tiny spoonful of sambal hairbee? I tell you, it is tastier than smoked salmon. Nowadays, you can hardly find sambal hairbee from economy rice stall because of the cost of dried shrimps and the chore of making it. So, the only way is to make your own sambal hairbee. Try it! 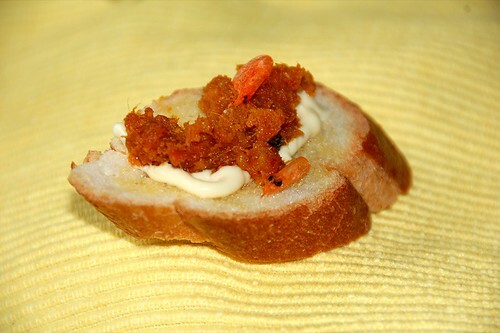 Never thought of sambal hairbee would go so well with a toasted french loaf ! Will definitely try this out as I have one bottle of sambal hairbee in my fridge, thanks to my aunt! I use sambai hairbee in my fried rice. Add sausages, long beans and finely sliced daun limau purut. I have used salmon meat ( steamed and deboned ) to cook with the sambai hairbee ingredients. The result looked like sambai hairbee but smell very fishy! yummyyyy…my tummy’s growling now. I have to gawk at your picts! I dare not buy the dried shrimps from Thai supermarket here. People told me they add red coloring to make it nice but when you cook it the whole dish became redddish ! Price…errr.. i rather starved until I’m back home 😀 I saw another type of large dried prawns.. har kon something like that. The Hong Kees love to use that in their cooking. Have you try cooking it before?